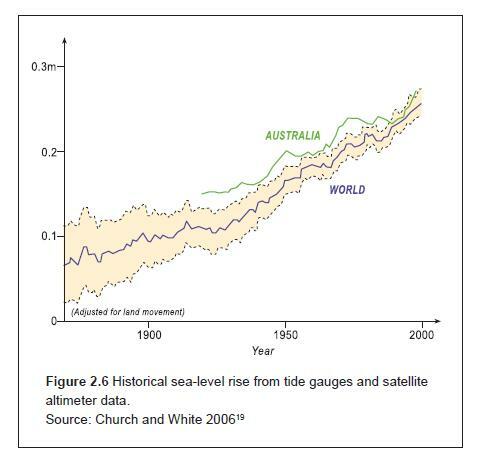 Why are Australian Sea Levels Rising? The answer, my friend, is blowin’ in the wind…. literally. At Sydney, the long term sea level rise is about 1 mm per year, with short periods of rapid increase and a long plateau of very small or zero trend in the second half of last century. As Australia is geologically stable, it is likely that a similar pattern occurred all around the coast. This gradual sea level rise is consistent with oceanic warming since the Little Ice Age, with fluctuations resulting from El Nino-Southern Oscillation (ENSO) changes. Tide gauge data since 1990 from different locations show rises varying from 2.4 mm to 7.2 mm per year. A significant proportion of this is due to ENSO wind circulation changes. 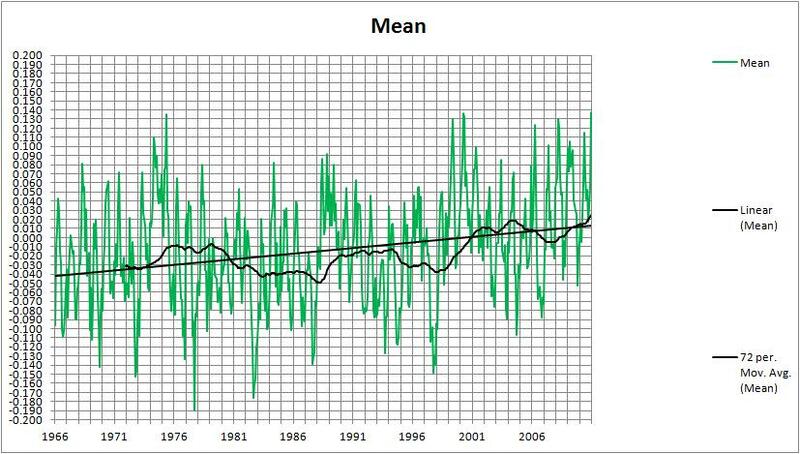 There is no sign of any unusual acceleration in Australian tide gauge data. These sites have monthly data only from 1990, mostly later, and two (Thursday Island and Port Stanvac) have very limited data and were not used in this study. 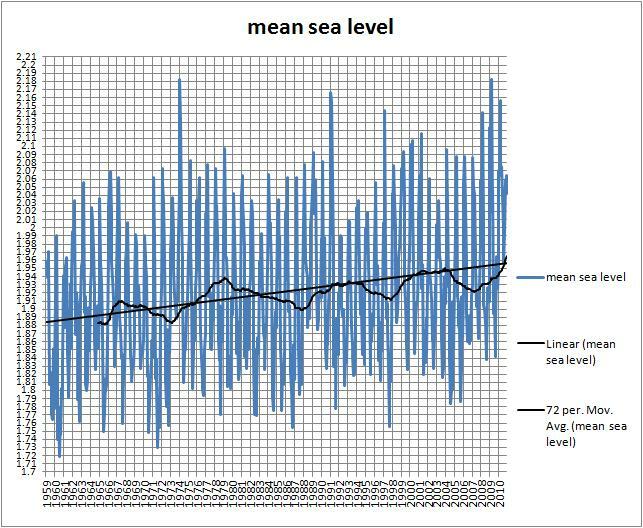 I have used data for Mean Sea Level for all sites on the Australian coastline to find the current situation with sea level rise, and use the much longer dataset from Fort Denison in Sydney Harbour as well for a longer term perspective. Figure 2 is a plot of all monthly data from all sites. The mean is a measure of central tendency: the full tidal range is at least twice the values shown for each site. Broome’s range is well over 11 metres. Portland has a very small range. An Australian average of these means is meaningless. Each site has a seasonal signal which is not regular. It is difficult to make any meaningful comparison. However if we look at sites individually, we can at least compare any trends. Figures 3 and 4 show MSL at sites with the greatest and least trends. According to this very short record, the rate of Australian sea level rise varies in different locations, from a low of 2.4 mm per year in Bass Strait to 7.2 mm per year at Hillarys in Western Australia. Why is this? Australia is very stable geologically, and these tide gauges are carefully checked with levelling connections between them and Global Navigation Satellite System (GNSS) sites maintained by State land and survey departments. Therefore differing rates of land movement are unlikely to be responsible. We need to compare all sites, and as well remove the seasonal signal. To do this I calculate monthly anomalies for each site, then plot the results in Figure 5. With the seasonal signal removed, the data show some roughly similar patterns for all sites. 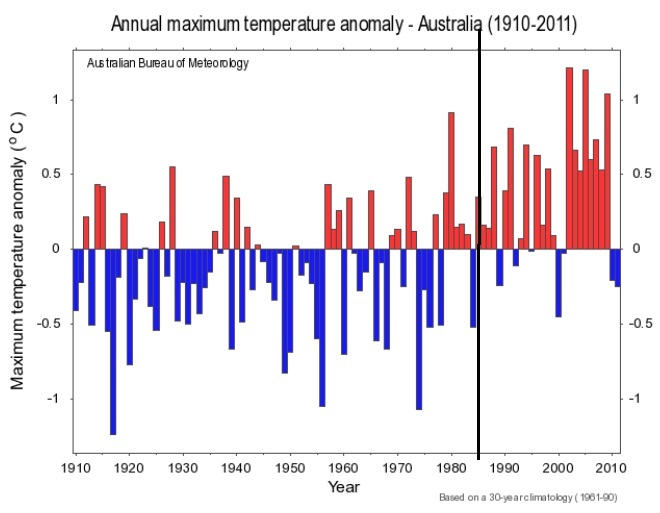 I now plot the mean of these anomalies, to find an “average” Australian sea level trend. All sites show marked dips in 1997-98 and 2015-16, clearly shown in the average. The influence of El Nino perhaps? Figure 7 shows the mean of all MSL anomalies with the scaled Southern Oscillation Index (SOI). 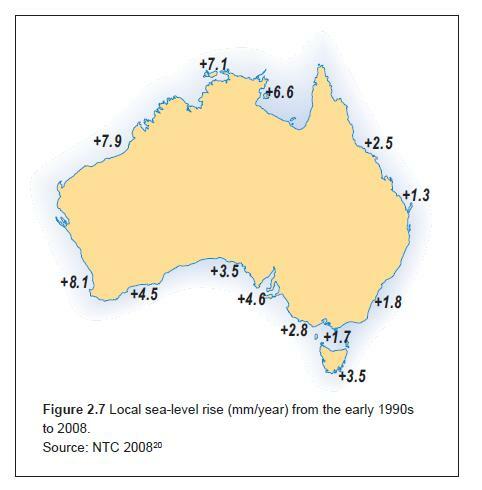 For every one point increase in the SOI, Australian sea level rises an average of 3.2 mm, and SOI change can account for more than a third of sea level rise. Now we check how the SOI has behaved over the last 27 years. In this short record, the SOI has increased by about 8 points. 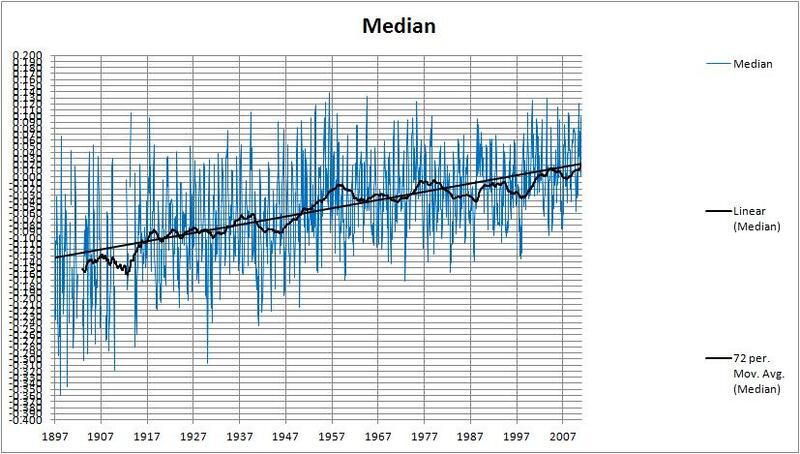 From this, we can deduce that a portion of the perceived sea level rise since 1991 is due to the influence of the El Nino- Southern Oscillation (ENSO), of which SOI is a strong indicator. What mechanism could there be for this? The SOI is calculated from the difference in atmospheric pressure between Tahiti and Darwin. Darwin’s sea level is compared with the SOI in Figure 10. During La Nina, when SOI is high, the northwest monsoon is strengthened, the monsoon trough penetrates further into northern Australia in summer with lower atmospheric pressure and stronger northwest winds. This combination pushes the sea up against the northwest coast, raising the sea level. In winter, the monsoon disappears and winds are predominantly from the east. During El Nino, the monsoon is weakened and may fail completely. Thus northwest winds are weaker and the sea level is markedly lower. That’s all very well for Darwin and other sites in northern Australia, but take a look at Figure 12, which compares seal level at Darwin with Spring Bay, in southern Tasmania, and about as far from Darwin as you can get without a passport. Note that in some (but not all) El Ninos (marked) Spring Bay sea level is also strongly affected. 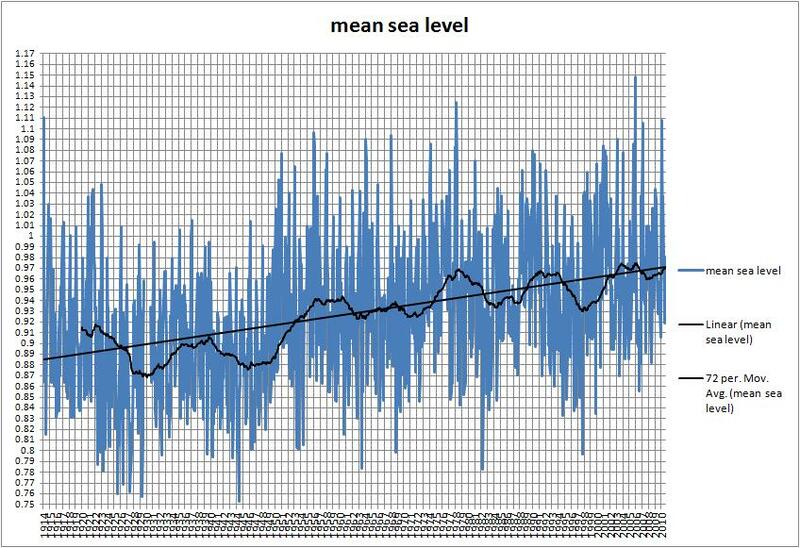 Note also that sea level at Spring Bay appears to start rising again several months before Darwin, in other words before the SOI starts rising. The 2015-16 comparison of anomalies shows the Spring Bay sea level at its lowest in September 2015, rising strongly and four months before Darwin’s. To understand this we need to consider circulation patterns as they change through the year and with ENSO events, and their effect on local sea levels. 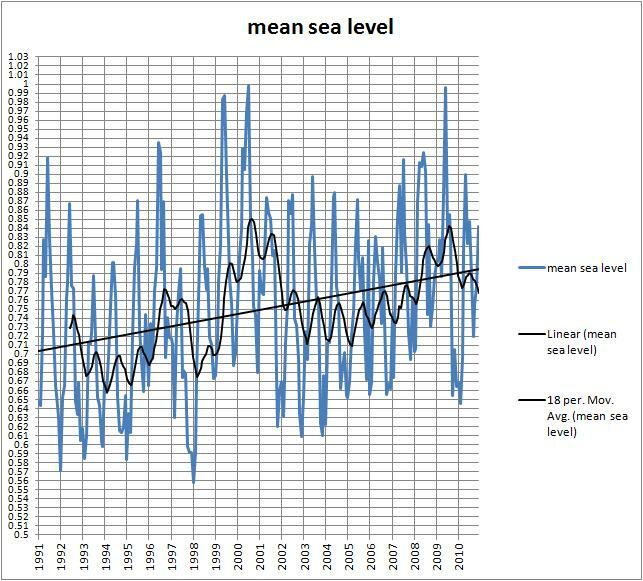 The following plots show the absolute 2015-2016 monthly mean sea levels and the long term average for each month. Darwin’s long term average sea level is highest at the peak of the Wet season (February – March) and lowest in the Dry (July – August). In 2015, the high was reached in January and the low in July- both one month earlier- and the 2016 high was in March- one month later. Below normal sea levels lasted from April 2015 to April 2016. In contrast, Spring Bay’s average sea level is highest in the southern wet season (Winter-July) and lowest in the summer dry season (November to February). In 2015 the high was reached in May and the low in September, and the 2016 high in May. This happens at other sites in the southeast of Australia (from Portland to Port Kembla including Tasmania). Fig. 16: Australian sea level at sites in the north and southeast. 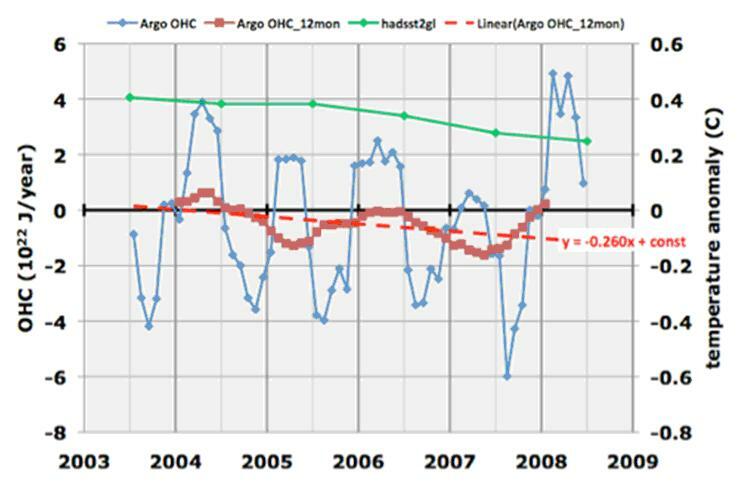 Note that the same pattern applies: sea level is lower in strong El Ninos and rises before the north (in 1997-98 and 2015-16 but not so clearly in 2006-07). A possible explanation is that circulation changes associated with the ENSO are not restricted to the tropics, although that is where the effects are largest and most visible. In normal (non-El Nino) years, the sub-tropical ridge moves north over the continent in winter, and the winter storms around the lows to its south bring rain and winds from the south-west quarter to the southern coast, particularly South Australia, Victoria, and Tasmania. These winds cause the sea to pile up (by a few centimetres) against the southern coast. In summer, the sub-tropical ridge moves south, rain bearing storms mostly pass to the south of the Australian region, and blocking highs in the Tasman Sea bring strong north-west winds across the south-east of Australia. This causes sea level to fall. In a strong El Nino, these conditions occur earlier, with a rapid retreat south of the sub-tropical ridge so that winter storms with south-westerly winds are fewer and weaker and sea level is lower in winter and spring. Summer sea levels (November to January) are close to normal. Figure 17 tests the response of sea level to barometric pressure at Spring Bay. The result is clear. More than half of sea level change is due to pressure variation, which causes winds to change. The effect is much greater at Darwin. 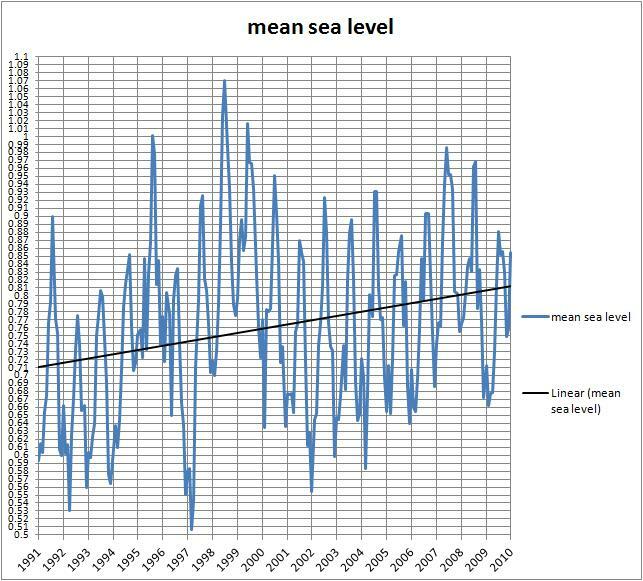 By the way, how much does increase in sea temperature affect sea level? At Spring Bay, very little. An increase of one degree could raise sea level by 17 mm, but R-squared of 0.033 is tiny compared with 0.527 for air pressure. Whatever causes El Nino also causes the southern seasonal weather cycle to occur earlier, and sea levels rebound several months before they do in the tropics. What of the longer term? 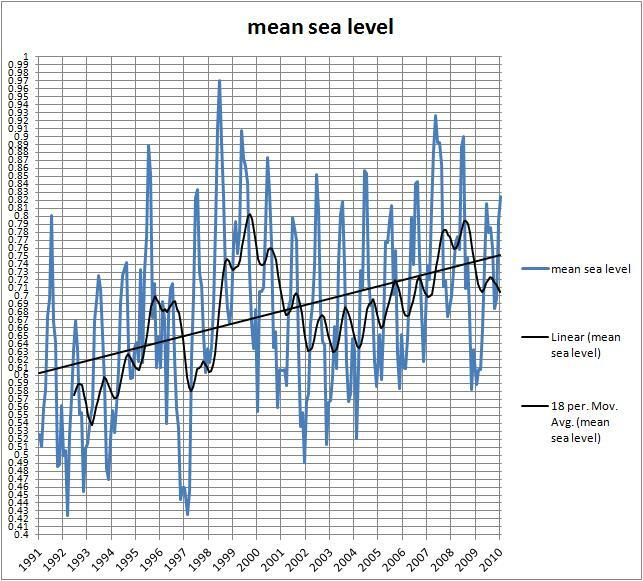 The Australian Baseline Sea Level Monitoring Project data are limited to sea levels since 1990, so the record is too short to make assumptions about long term sea level rise, and certainly not about the future. There are longer datasets available however. Sydney Harbour (Fort Denison) has data from 1914. 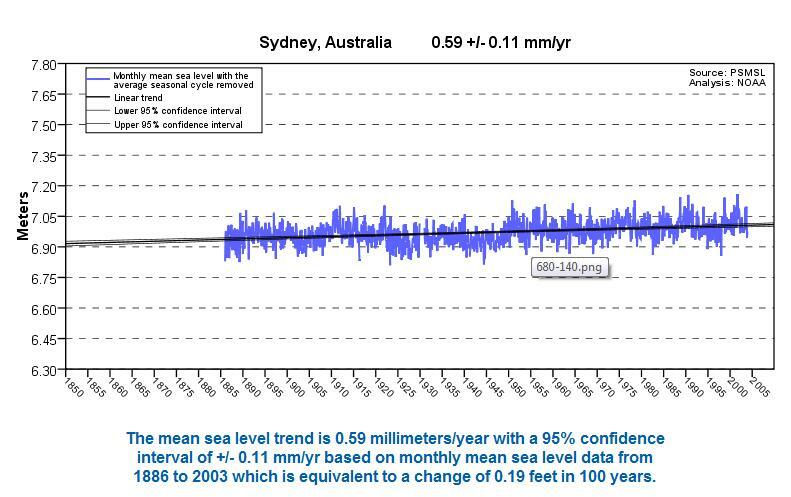 A significant portion of the recent sea level rise at Sydney can be attributed to a short term rise in the SOI. 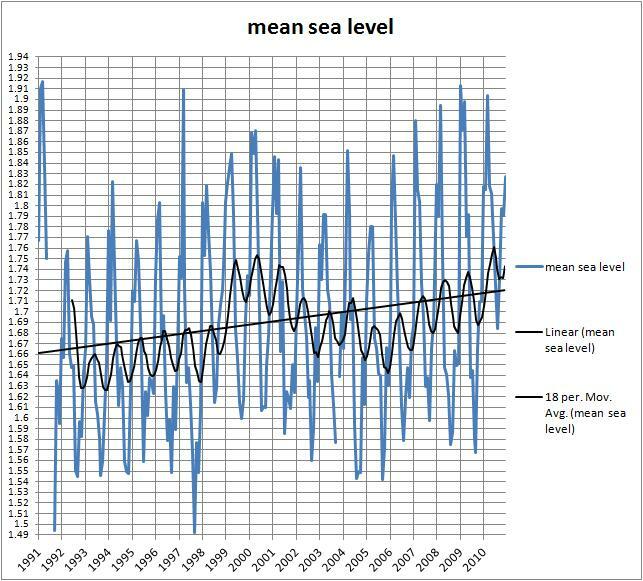 The most recent rise in sea level of 7 to 8 mm per year over 10 years is less than that of the rise to 1953, when sea level rose by 10 mm per year. The current 30 year trend is exactly the same as the trend to 1965: 2.4 mm per year. For the 30 year period to the mid-1990s the trend was zero. Across all tide gauges of the Australian Baseline Sea Level Monitoring Project, a significant proportion of sea level rise since 1990 is due to circulation changes associated with the El Nino- Southern Oscillation. The effect is much greater in the north and west, where sea level rise is highest, but also is evident in the south-east. 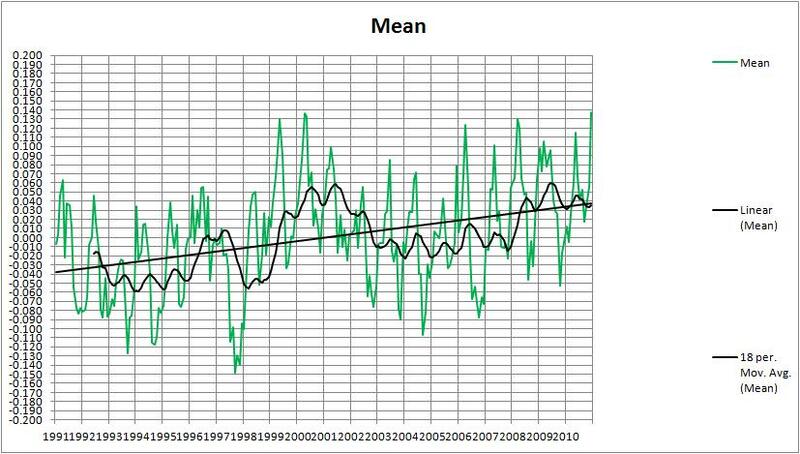 There is no sign of any unusual acceleration in Australian tide gauge data. In 100 years from now sea level could be expected to be 100 mm to 200 mm higher. A sea level rise of 5 to 10 times this amount is purely speculative and not based on empirical data, but instead is based on the worst case scenario of computer models. I wonder how things are going after 12 months? So Morin, getting back to sea levels in the Pacific, what do you think sea level at Kiribati will be a year from now- higher, lower, or the same as now, and why? I reckon it will be lower- because of the ENSO cycle. The Pacific will be in neutral or La Nina phase by then, trades will be dominant, with less westerly wind bursts on the Equator. Hard to say – there’s so much warm water in the Pacific that I think it’s too early to say how the cycle will progress. We could be looking at a double-dip El Nino or a strong neutral (or would that be weak neutral?) phase, not proceeding immediately to a La Nina. So 12 months ago I predicted sea level at Kiribati would be lower because of the ENSO cycle. And this is the position now. 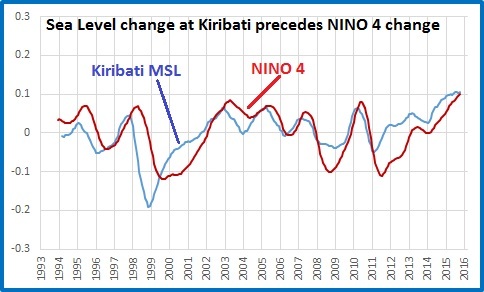 Kiribati sea level change still precedes NINO4 change, and sea level has fallen from the highest it had been in this record to about average. Pacific Sea Levels- Warming, ENSO, or Wind? Apparently our Opposition Leader Bill Shorten, his deputy Tanya Plibersek, and immigration spokesman Richard Marles are heading off to the Pacific to discuss “the dangerous consequences of climate change”, all paid for by media baron Harold Mitchell, according to yesterday’s Weekend Australian. They will visit Papua New Guinea, the Marshall Islands, and Kiribati (pronounced “Kiri-bahss”). The President of Kiribati leads the complaints about the threat of global warming to his island nation. 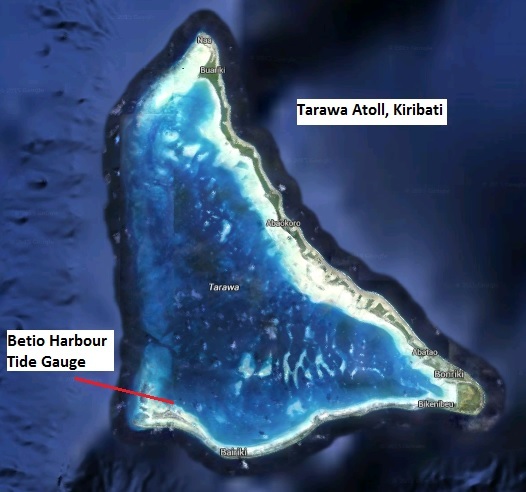 Kiribati has indeed seen foreshore erosion and salt water intrusion in recent years- just don’t mention causeway construction and underground water extraction. Sea level rise in Kiribati and the Marshalls has nothing to do with climate change and everything to do with the ENSO cycle, and winds in particular. In this post I use data from the Australian Bureau of Meteorology’s Pacific Sea Level Monitoring Project at http://www.bom.gov.au/pacific/projects/pslm/. I also use NINO 4 data from http://www.cpc.ncep.noaa.gov/data/indices/sstoi.indices and Trade Wind Index data from http://www.cpc.ncep.noaa.gov/data/indices/wpac850. Fig. 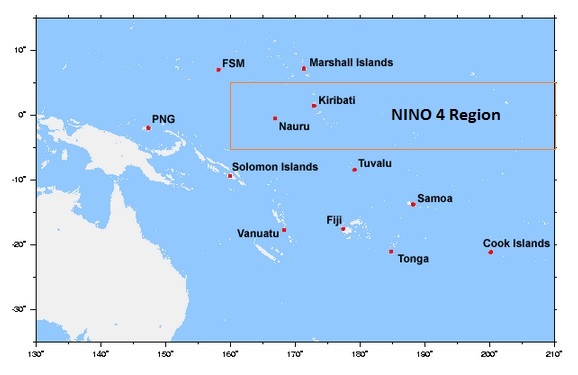 1: Island nations in the Pacific Sea Level Monitoring Project, also showing the area of the NINO 4 index. (Click graphics to enlarge). 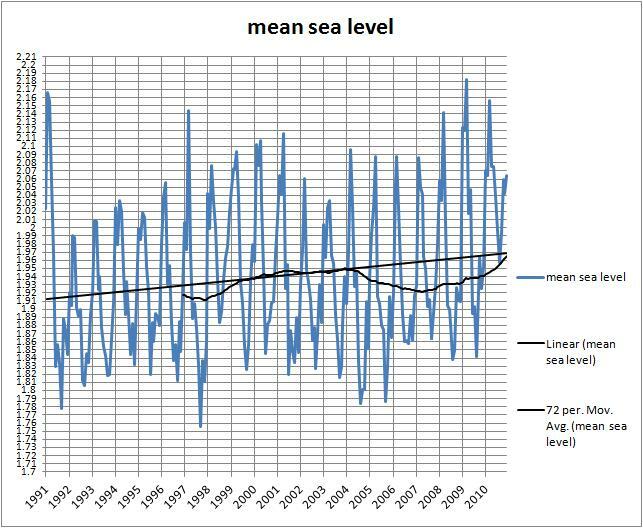 I have converted raw mean sea level data to monthly anomalies from 1995-2014 means, and scaled down NINO 4 and Trade Wind data, in order to make comparison easier. 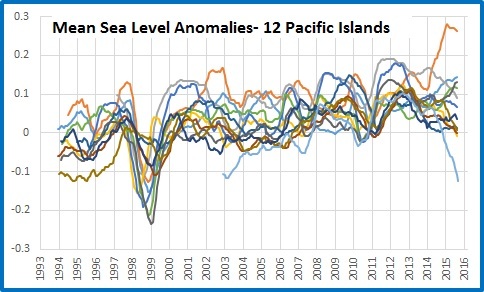 This figure shows sea level data at all of the islands in the BOM’s Pacific Sea Level Monitoring Project. Fig. 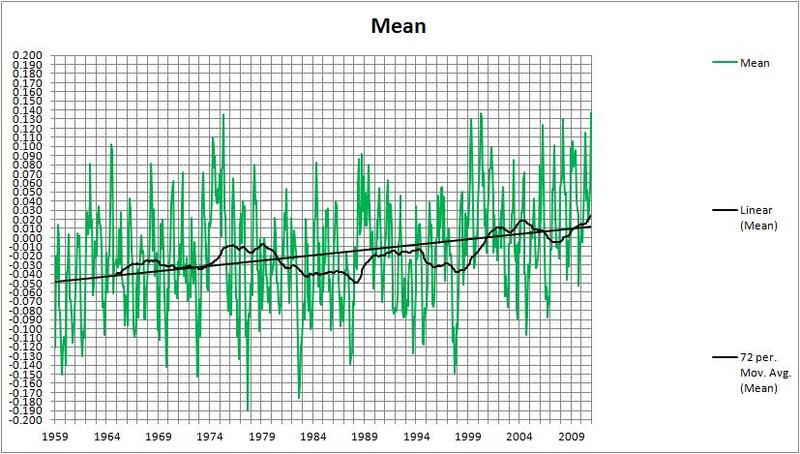 2: 12 month smoothed sea level anomalies, 1992-2015, for all islands in the Sea Level Monitoring Project. The vertical axis is in metres. Point 1: While there is broad agreement on rises and falls, the timing of the rises and falls is very mixed- some rise at the same time as others fall. This is clearly shown by Kiribati and the Marshalls- when one is rising the other is falling. Fig. 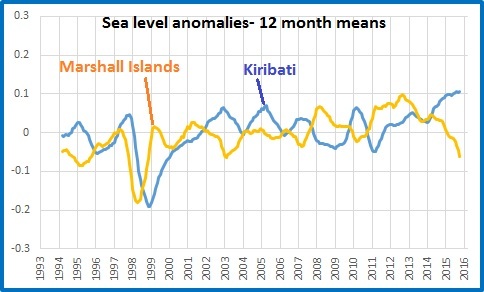 3: 12 month sea level anomalies at Kiribati and Marshalls, 1992 to 2015. Perhaps Mr Shorten can discuss why sea level changes at the Marshalls precede those at Kiribati by many months, such that they are presently moving in opposite directions. Point 2: There is no doubt that from 1992 to 2015, throughout this region sea levels have been rising: both the Marshalls and Kiribati by 4.8 mm per year. However, since sea level rise occurs at different times, it cannot be due to temperature change. This is further reinforced by the next graphic. Fig. 4: NINO sea surface temperature anomalies, January 1982- September 2015, 12 month means. 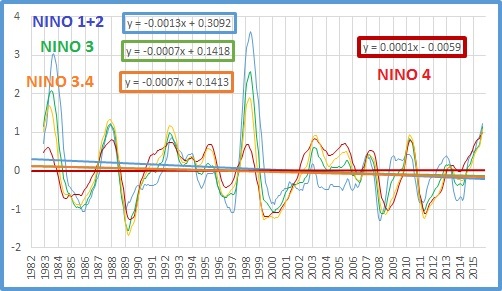 NINO 4 sea surface temperature anomalies since 1982 have almost zero (+0.01C per decade) trend (and the other indices show negative trend in sea surface temperatures). The tropical Pacific has not warmed. At first glance, sea level change at these islands appears to correlate well with El Ninos and La Ninas, however close analysis shows a much more complex picture. 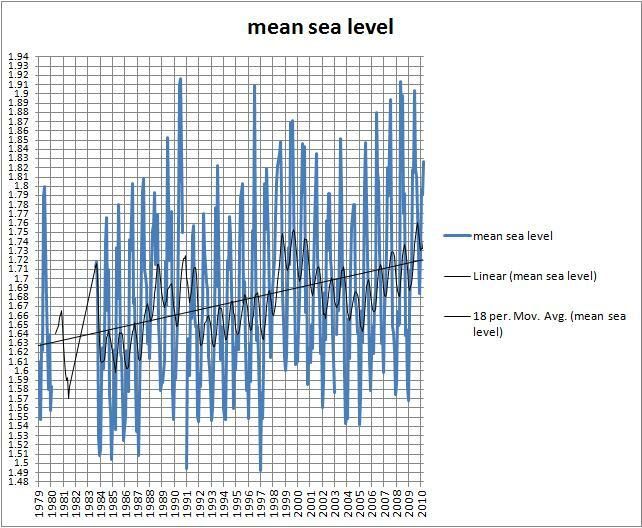 Note that sea level changes several months before the NINO 4 index. Fig. 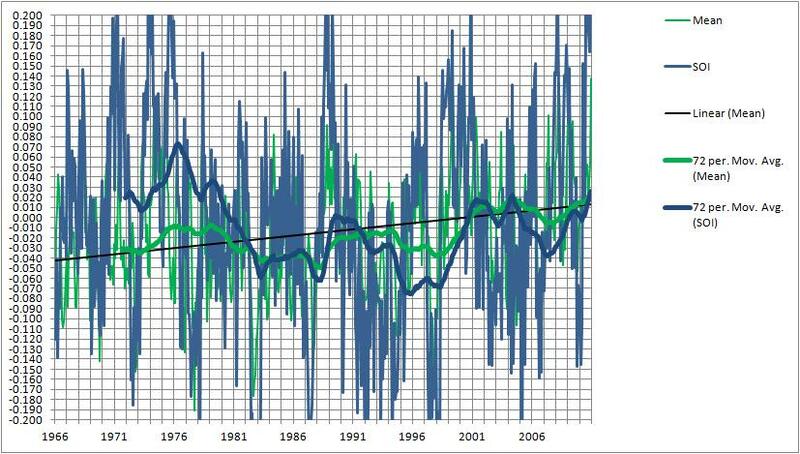 6: 12 month running means of Marshall Islands sea level anomalies compared to the Trade Winds Index. 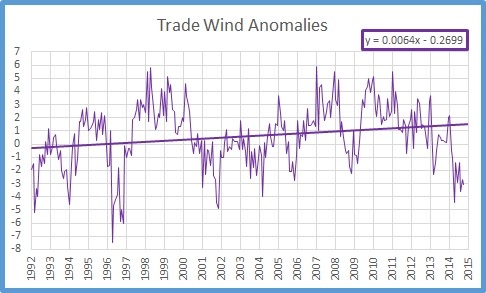 Note that the Trade Winds mostly change simultaneously with or some months before sea levels change. 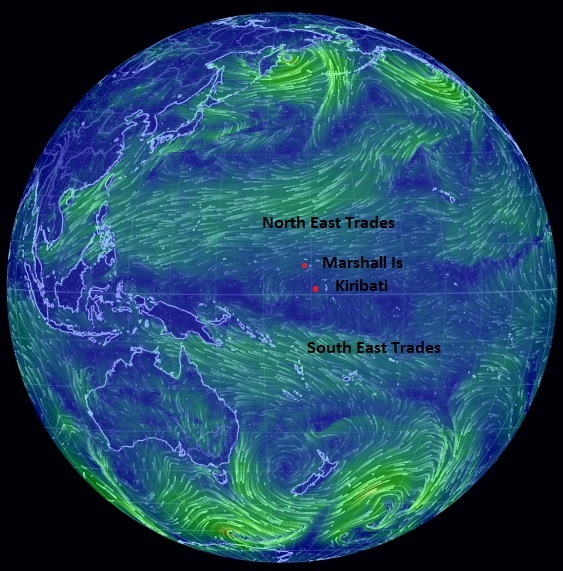 Point 3: Sea level changes at Kiribati precede ENSO events, as measured by the NINO 4 index, but follow or match the Trades at the Marshalls (just to the north of the NINO 4 region). However, in Figure 3 above, note that sea level anomalies at the Marshalls PRECEDE Kiribati. So what is the cause of sea level rise in the western Pacific, which is an alarming 4.8mm per year at Kiribati and the Marshall islands? The Trade Winds have been increasing throughout the period of the Sea Level Monitoring Project, pushing surface water from east to west across the Pacific. At Kiribati westerly wind pulses, which help to initiate and strengthen El Ninos, push water against the low coral cay and raise the sea level at the tide gauge, (located on the western side of Tarawa, which is in normal and La Nina years the leeward side). When these winds slacken and trade winds strengthen, the sea level drops. In the rising sea level phase, the westerly winds push warmer water eastwards, and the weaker trades do not bring in as much cooler water from higher latitudes. Thus the rise in sea level at Kiribati precedes a rise in sea surface temperature, and the peak in sea level occurs about 5 months before the peak in NINO 4, one of the El Nino indicators. 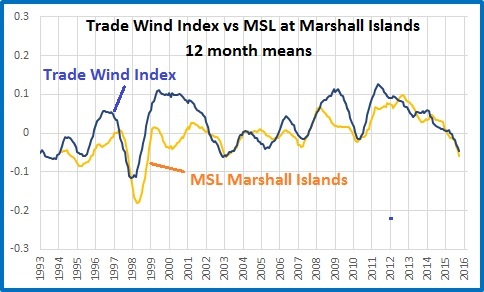 Conversely, weaker trade winds bottom out some months before the bottom of sea levels at the Marshalls, which are to the north of the area affected by westerly wind pulses. 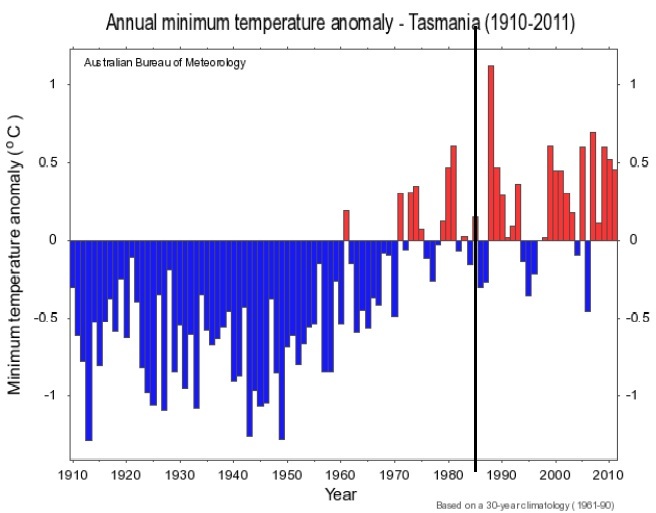 Therefore we can reassure Mr Shorten and his pals that sea level rise has little to do with climate change (unless alarmists claim that global warming will lead to stronger La Ninas, which lead to cooler temperatures- but I thought the plan was for more El Ninos). Sea level rise is largely due to wind. And no doubt Mr Shorten will contribute to that. An update on my recent post about Catalyst. 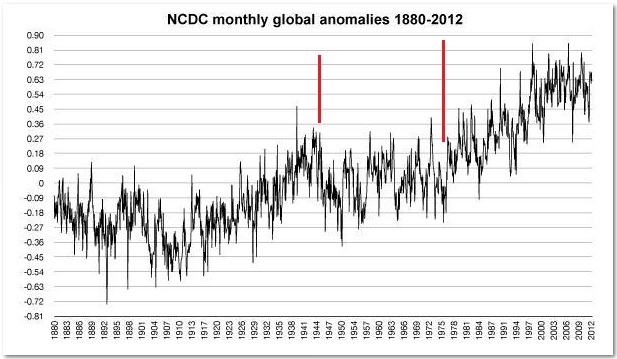 Most viewers (myself included) would not have realised that the “330 months since February 1985 of above average temperatures” reference had nothing to do with Australia, but was in fact based on an as yet unpublished paper by Dr Mark Howden of the CSIRO, who seems to have obtained his data from the NCDC. (Unpublished? So not yet peer-reviewed? Tut-tut, ABC!) As it is not yet published, we can’t access it or check Dr Howden’s methods and calculations, so the 1:100,000 chance of having 330 months in a row of above average temperature not being caused by the greenhouse effect seems a bit odd. 2 to the power of 330 is somewhat more than 100,000! Whatever. I’m sure it’s very interesting. But that had nothing to do with the stated subject of the program, which was “Taking Australia’s Temperature”. It appeared to be thrown in as a late filler. Perhaps there was no deliberate deception planned, however to include that claim without clarifying that it was not Australian data but global data resulted in at least one viewer (me) being misled. But let’s have a closer look at this claim, seeing as it has been raised. 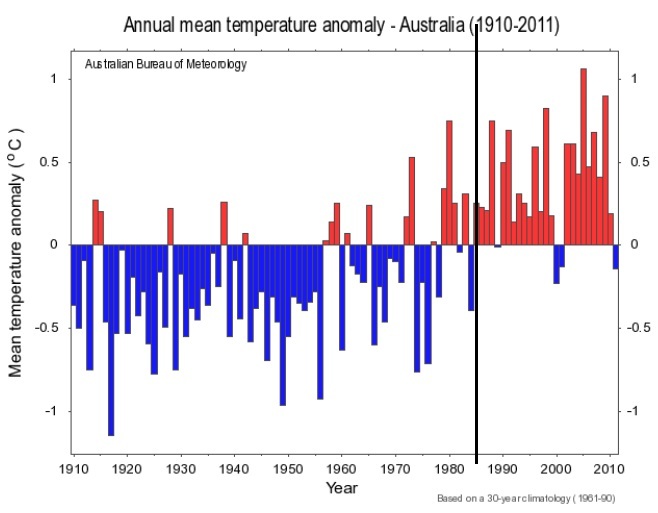 Yes the world has warmed, and so has Australia, over the last 100 or so years, somewhere between 0.4 and 0.7 degrees Celsius. 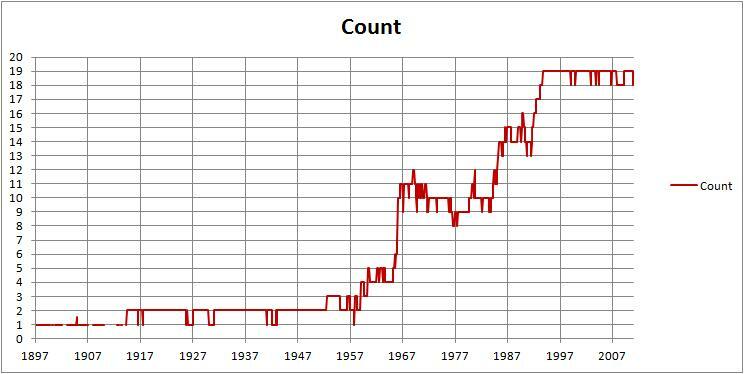 Thanks to Chris Gillham, here is a graph of the NCDC data, from 1880. 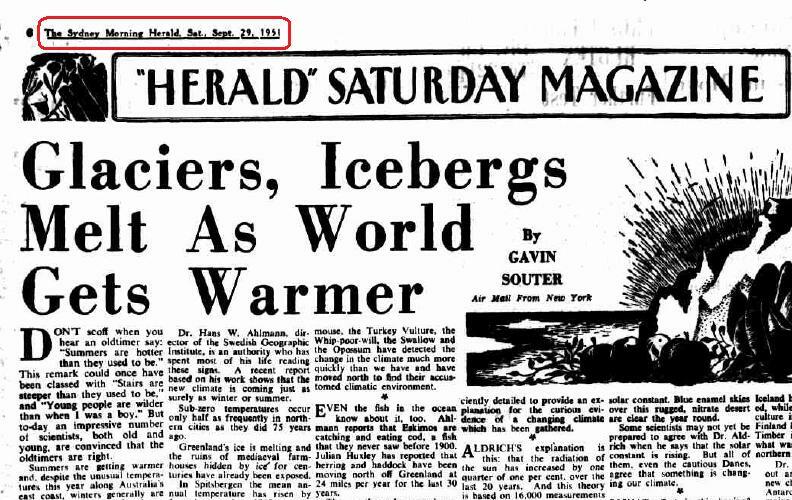 I’ve marked in the period between 1944 and 1976, when there was a distinct cooling period. And this is the monthly data since 1985. Warming? Of course. Continuously? No. 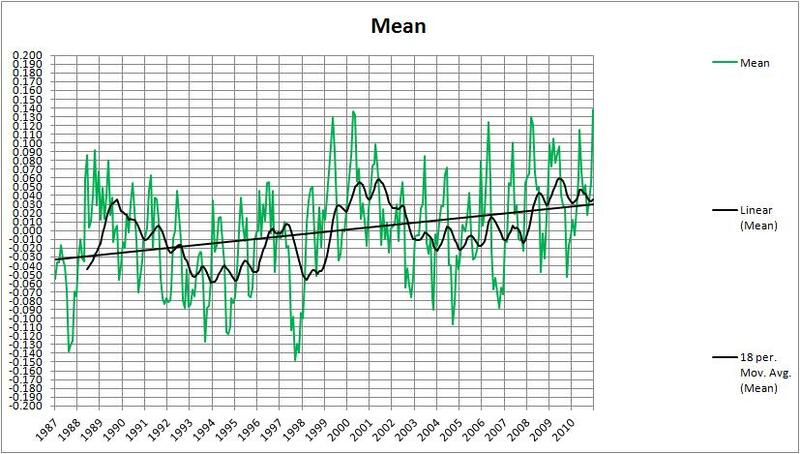 The warming has definitely slowed, plateaued, or possibly even reversed since 2001-2002. 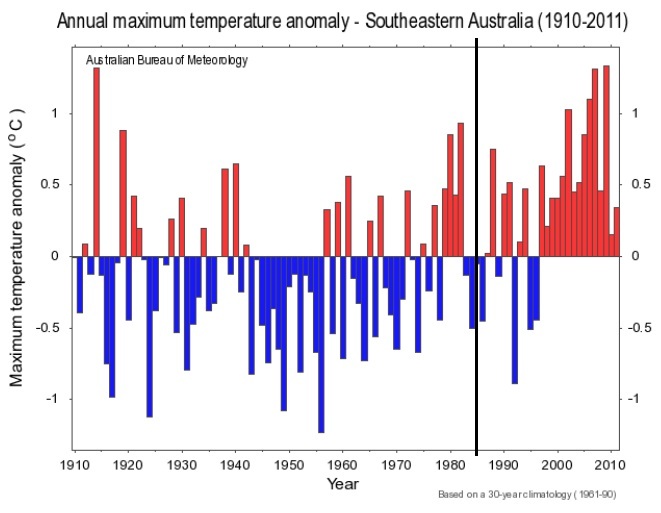 Yet every month of this data series is above the average for the 20th Century, which apparently was reached at the beginning of 1985, so Dr Howden and the CSIRO are technically correct. But let’s look at some completely different data. This is a graph of the Australian share index, courtesy of the ASX. In spite of the 1987 crash, the Asian bust, the GFC, every point since 1985 is above the value then. Another example. Imagine driving from say Brisbane to western Queensland. The average altitude of Australia is 330m. Half way up the Toowoomba Range you pass this altitude. Past Toowoomba, driving across the fairly flat Darling Downs, be warned that every kilometre is above the average altitude. So when you reach Roma we can say that for more than 300 kilometres every kilometre has been above the average altitude. (OK, there are a few dips when you get close to Roma, but let’s homogenise them.) Scarey hey! The point? 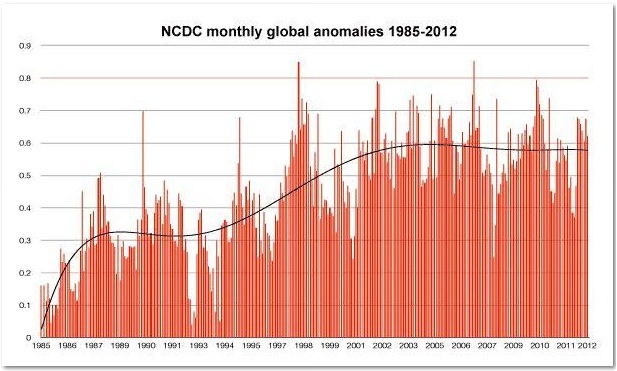 The world has been warming since the mid 19th century. In a warming climate a point will eventually be reached where despite cooling episodes, every data point will be above the average. The little exercise with the wine bottles in Catalyst proves absolutely nothing, especially not about Australia’s temperature. The trouble is, some people believe the mis-information spread by the BOM, the CSIRO, and the ABC. 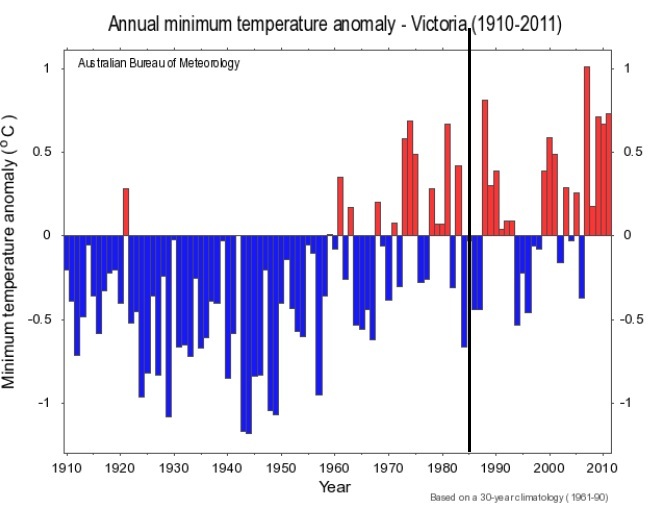 There was no mention of where or what temperatures were being referred to, although the context was grape growers moving from Victoria to Tasmania, so let’s check with the Bureau’s High Quality temperature records, for Victoria,Tasmania, South East Australia, and Australia as a whole. I’ve marked 1985 to make it clearer. 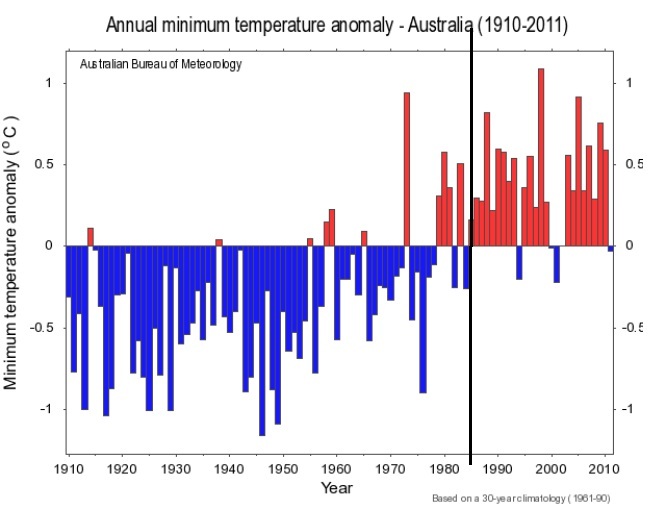 And Australia as a whole, means: So there have been several years of below average temperature, and you can’t get a below average year without a number of below average months. 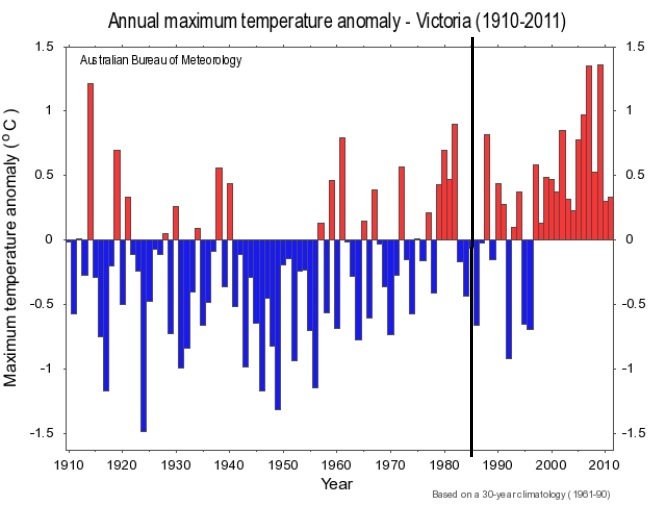 Don’t take my word for it, search the Bureau’s web pages for yourself: there is no State or Region with 330 consecutive months of above average temperature since February 1985.
e) a problem with the basic honesty of the presenters of this program in not highlighting that this was not representative of the broader record. It was Dr Mark Howden of the CSIRO Climate Adaptation Flagship who made this fantastic claim. Dr Jonica Newby, scientist/ journalist that she is, accepted and repeated it without question, so is jointly responsible. If I am not looking at the relevant data, I stand to be corrected, and will apologize. Unless they can offer some explanation or correction, they must obviously stand by their untruth. Once we could trust and be proud of our great institutions. Now it seems it’s up to ordinary people to hold them to account. DON’T scoff when you hear an oldtimer say: “Summers are hotter than they used to be.” This remark could once have been classed with “Stairs are steeper than they used to be” and “Young people are wilder than when I was a boy.” But today an impressive number of scientists, both old and young, are convinced that the oldtimers are right. 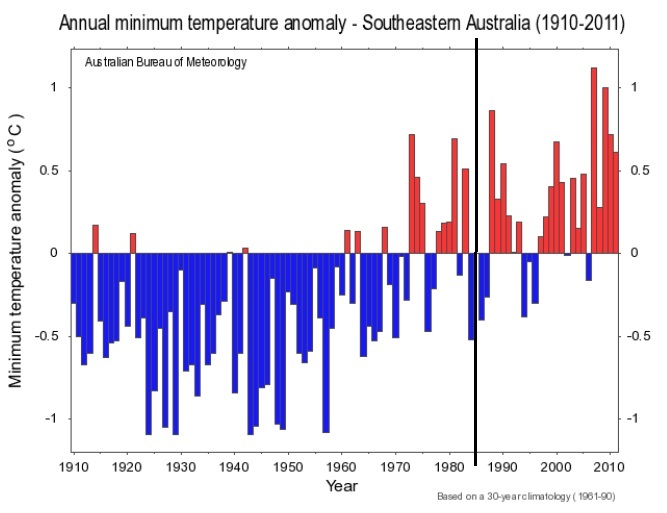 Summers are getting warmer and, despite the unusual temperatures this year along Australia’s east coast, winters generally are not as cold as they used to be. That’s right, the Sydney Morning Herald from 61 years ago. Do you think Bob Menzies would have introduced a Carbon Tax? Thanks to Chris Gillham for finding this. This climatic fluctuation which began a century ago and has become more noticeable in the last 20 years has been discussed since the nineteen-twenties almost exclusively in scientific circles. Recently, however, it has become a subject of more than academic interest. The scientists hasten to assure the world that there is no immediate cause for alarm. The change is merely part of the endless cycle of heat and cold which started with the first ice age about one million years before the birth of Christ. There is not yet reason to assume, say the scientists, that the mercury in the world’s thermometers will now rise any higher than it would have risen during two or three other unusually warm periods since the beginning of our calendar. These were not years which scorched the globe as fatally as the ice ages had frozen it. But they were years of mild winters and hard summers. In some parts of Central Europe, Africa and the Americas they brought drought. Since the turn of this century, meteorologists and their grander associates, the climatologists, have been laboriously gathering evidence of the latest change. The account of these labours from Alaskan glaciers to African lakes is as fascinating as any detective story. New seasons come gently with falling leaves, the glint of hoar, frost and the song of birds. New climates come spectacularly. Their harbingers are shrinking glaciers, disappearing lakes and the crunching of a moving ice-pack. Dr. Hans W. Ahlmann, director of the Swedish Geographic Institute, is an authority who has spent most of his life reading these signs. A recent report based on his work shows that the new climate is coming just as surely as winter or summer. 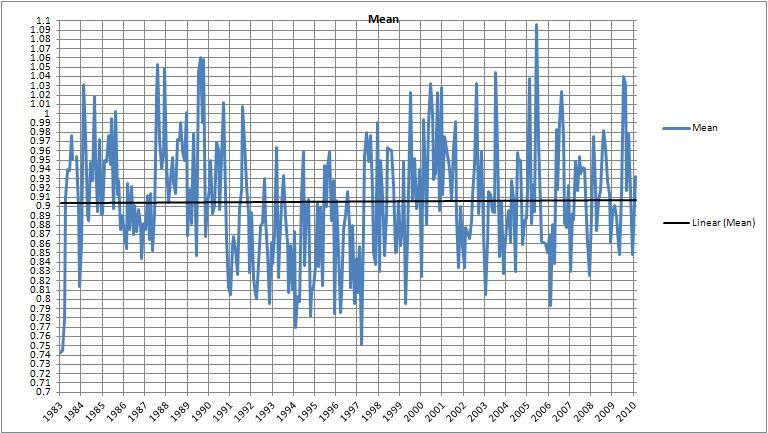 Sub-zero temperatures occur only half as frequently in northern cities as they did 75 years ago. Greenland’s ice is melting and the ruins of mediaeval farmhouses hidden by ice for centuries have already been exposed. In Spitsbergen the mean annual temperature has risen by four degrees since 1912. Ships ply the White Sea and the Gulf of Bothnia three or four weeks longer than they used to. In Iceland and the higher latitudes of Norway farmers are growing barley in soil that was once frozen for seven months each year. All glaciers examined from Greenland through Scandinavia to Europe are shrinking. And the shrinkage is not limited to high latitudes. Some glaciers in the European Alps have vanished completely. In East Africa, the glaciers on three high volcanoes – Kilimanjaro, Mt. Kenya and Ruwenzori – have been diminishing since they were first observed in 1880. The vast Muir Glacier in Alaska’s Glacier Bay has retreated a full 14 miles since 1902. A young professor at the University of Wisconsin in the far north of the United States, Joseph Hickey, has been watching the birds of his State for the last ten years and he, too, is convinced that the climate is warming up. Comparing his observations with existing records, he says that many species of American birds and mammals have moved as much as 100 miles northward over the last 40 years. The Titmouse, the Turkey Vulture, the Whip-poor-will, the Swallow and the Opossum have detected the change in the climate much more quickly than we have and have moved north to find their accustomed climatic environment. Even the fish in the ocean know about it, too. Ahlmann reports that Eskimos are catching and eating cod, a fish that they never saw before 1900. Julian Huxley has reported that herring and haddock have been moving north off Greenland at 24 miles per year for the last 30 years. The seas themselves are changing. Sea levels rose when the glaciers of the last ice age began to melt. And now they are rising again. One geographer reports a general rise throughout the world to the order of one millimetre during the last 30 years. Ahlmann, however, has measured a specific increase of one millimetre each year in the level of waters off Spitsbergen. That distance may be only .039 of one inch but geographers think it important. Inland lakes have fared worse. With no melting glaciers to replenish them, many lakes are slowly disappearing. Dr. E. Nilsson, of Stockholm University, visited Africa in 1947 and found that the water level in Lake Victoria had fallen seven feet in the last 10 years! In America, the Great Salt Lake in Utah has lost nearly 50 per cent of its volume since 1850. Its salt content has doubled during that time. These cases of the Vanishing Lakes, the Shrinking Glaciers, and the Frightened Birds have now been solved and the sun stands accused. Dr. L. B. Aldrich, an astrophysicist at the Smithsonian Institute in the United States, published a report this year showing that the sun has poured enough extra heat onto the surface of the earth to affect our climate noticeably. Other scientists, however, feel that Aldrich’s data is sufficiently detailed to provide an explanation for the curious evidence of a changing climate which has been gathered. Aldrich’s explanation is this that the radiation of the sun has increased by one quarter of one per cent over the last 20 years And this theory is based on 16,000 measurements made in Chile during those years. Aldrich says that summer is getting warmer all the time. His data has been gathered in recent years by two young American university graduates. These young men spend two years in Chile before they are relieved by another pair from the United States. At a weather station on Mount Montezuma, high above the Atacama Desert in Northern Chile, these observers have been measuring the unit of the sun’s radiation-the solar constant. Blue enamel skies over this rugged, nitrate desert are clear the year round. Some scientists may not yet be prepared to agree with Dr Aldrich when he says that the solar constant is rising. But all of them, even the cautious Danes, agree that something is changing our climate. What effect is this having? Russia already has good cause to be thankful for that increase of one quarter of one per cent. Navigation conditions along her northern coasts have improved considerably since the turn of the century. In 1910 most of the sea lanes were open for only three months. Now they are open eight months each year. Equally important is the economic benefit derived from increased vegetation in northern latitudes. Barley cultivation in Iceland has already been extended, while the prospects for agriculture in northern Sweden and Finland have similarly improved. Timber is now growing beyond what was once the snow line in northern Scandinavia and Alaska. Dr Ahlmann has pointed out another effect which the new climate may have. If the Antarctic ice regions and the major Greenland ice-cap should continue to melt at their present rates, he says, the surface of the ocean may rise lo catastrophic proportions. “People living in lowlands along the shores would be inundated,” he warns. The more things change, hey! Sea Level Change in Australia: What’s Likely? Sea level rise is in the news again, with Nils-Axel Morner’s article in the Spectator and news in the Daily Telegraph that papers arguing against official claims of sea level rise have been stopped from being published. It’s two years since the release of the CSIRO and Climate Change Department’s publication, Climate Change Risks to Australia’s Coast, (Dept of Climate Change and Energy Efficiency ,2009) which predicted sea level rise of up to 1.1 metres above 1990 levels by 2100. Scary stuff. This led to many local governments and State governments suggesting restrictions on coastal developments. Since then we’ve had Climategate 1 and 2, some leadership changes, an election, floods and cyclones, and two cool years. We’ve also seen the Climate Commissioners broadcasting their doom and gloom, in their May report and their recent Climate Change and Health report. I’ll let others demolish the nonsense in this most recent one. Instead I’ll investigate the honesty and reliability of the Climate Commission, the CSIRO, and the Department of Climate Change, in their continued predictions of dangerous sea level rise. This is in line with Climate Change Risks to Australia’s Coast. The authors of both reports base the prediction of 1.0m this century largely on IPCC AR4, 2007, and claim this is supported by high-quality satellite observations which showed a rate of 3.1 mm per year between 1993 and 2003, and National Tidal Centre gauges at 14 locations around Australia which showed a mean rise similar to the global mean between the early 1990s and 2008. 0.5m per century is 5mm per year. 1m per century is 10mm per year. Therefore I will look at evidence for this claim from existing Australian data. 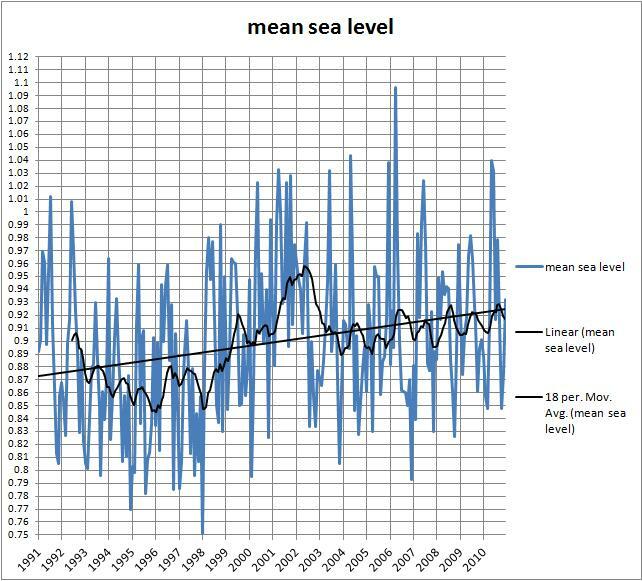 (Sea level has risen) 1.8 millimetres per year from 1961 to 2003. 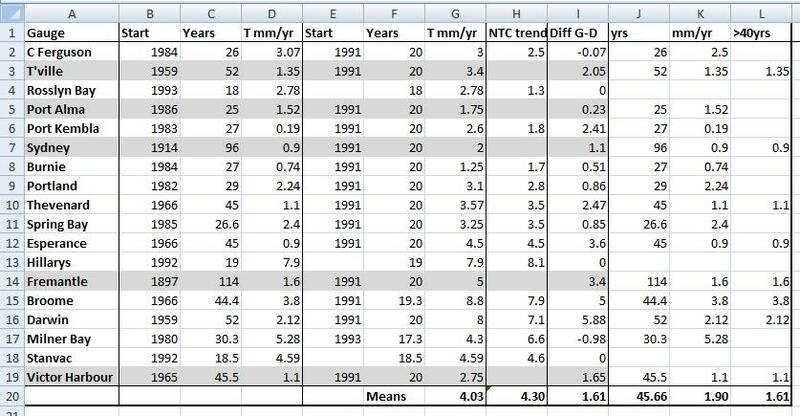 And satellites show a rise of 3.1mm/year from 1993-2003, which agrees with NTC data. So where do they get claims for acceleration? These rates of increase are an order of magnitude greater than the average rate of sea-level rise over the previous several thousand years. … implying acceleration, for 2 metres in 6000 years is 0.3mm per year. 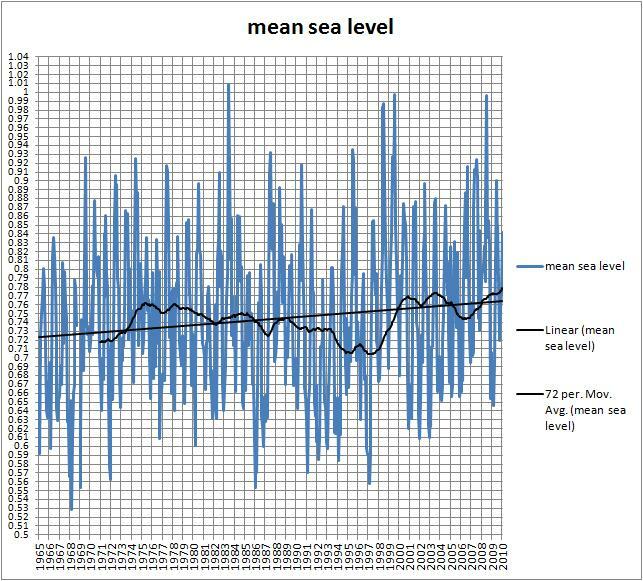 However, sea level oscillated in a +/- 2 metre band- so the time frame for each rise or fall in this period was much shorter- if it rose or fell 2m in 2000 years, that would be 1mm per year. Is there evidence for this? Well, there is for sea level fall. 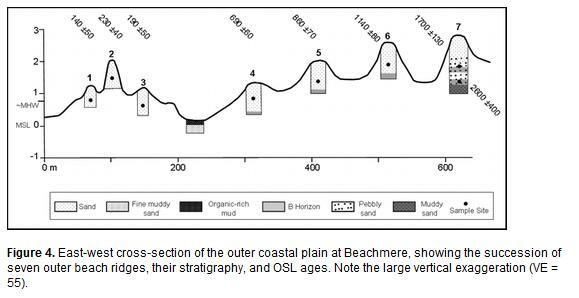 From an article in the Journal of Coastal Research, here’s a diagram from a study of sand ridges at Beachmere on Moreton Bay in SE Queeensland. Note on Ridge 7, pebbly sand couldn’t be wind blown, and sits above B Horizon, and B Horizon is at about 1.7m above current mean sea level. Ridge 7 is 1700 +/- 130 years old. 1700mm in 1700 years is 1mm per year. Ridge 6 is 1140+/- 80 years old, and B Horizon is about 1.5m above current MSL, so fall was rapid until 600 yrs ago. The authors then explain how CSIRO has developed three simple scenarios for sea-level rise (relative to 1990), based on AR4. Scenario 3 (High end) considers the possible high-end risk identified in AR4 and includes some new evidence on icesheet dynamics published since 2006 and after AR4. Although the length of record from Baseline stations is relatively short in climate terms there are a number of clear results emerging. 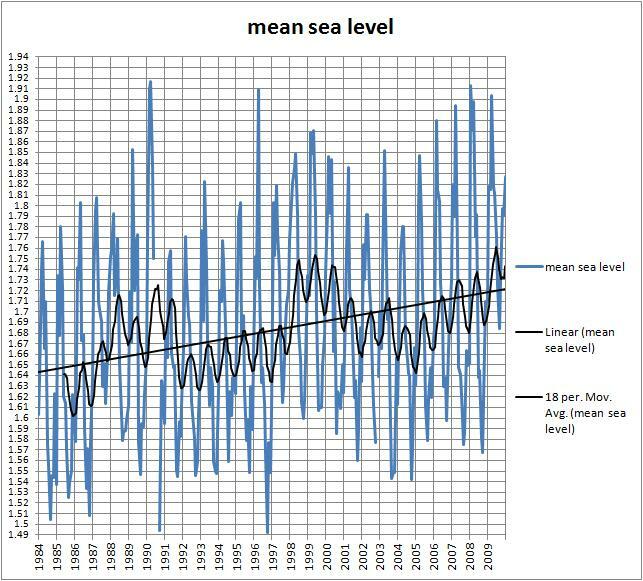 The sea level records for all stations, when corrected for local land movement and changes in atmospheric pressure, demonstrate a regional pattern of sea level trends that is consistent with sea level changes detected by satellite-based altimeters. 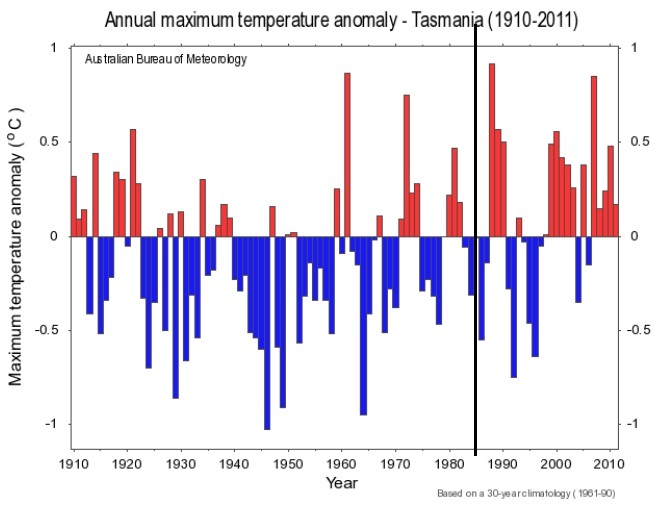 While the BOM in its annual report 2009-2010 on the National Tidal Centres admits that the record is not long enough to derive any trends, it seems it was quite long enough for the CSIRO and the Climate Change Department. So what is most likely for the next 89 years? 3.1mm/year, 5mm/year, or 10mm/year? Let’s look at the data from a selection of the NTC sites, and compare with nearby tidal gauges. Note that the Bureau of Meteorology has longer term records from a number of these sites, using earlier equipment, and one hopes the new gauges were calibrated with these records. The grey highlighted lines are for non-NTC sites used for comparison. Column H shows the figures given by Climate Change Risks, which says only that the data is from “the early 1990s” to 2008, so cannot be replicated. Column D shows long term trend, column G shows the short term trend, column K is data for stations with more than 20 years data, and Column L is for those with more than 40 years data. Longer term sites show a lower trend. All except two of the sites (Cape Ferguson and Milner Bay) have short term trends that are greater than their own long term trends or that of nearby sites. Sometimes they are only a little greater but mostly several times greater. Is this acceleration or natural variability? Differences may be due to uneven rise or fall of land and corrections for this. 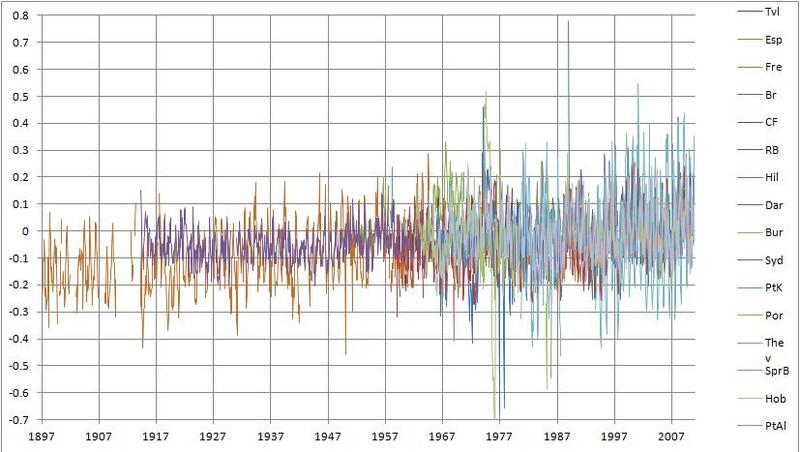 Here’s a spaghetti plot of anomalies from 1991-2010 for all 19 records. Apart from Milner Bay (at Groote Eylandt, in the Gulf of Carpentaria),which has a much greater variability, there is little inconsistency. Broome, Hobart and Darwin have some up and down spikes, and Burnie has a period in the 1950s that may be spurious. However, in general they are remarkably consistent- so much so that I am confident in calculating mean and median series. 1.4mm/year. 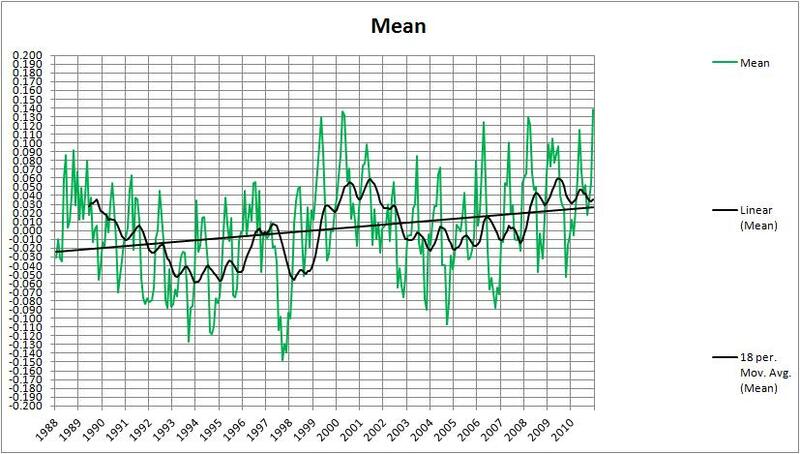 The 6 year running mean clearly shows the interdecadal variability. There was a steady rise from 1920 to the late 1950s, particularly from the mid 1940s, followed by a flat/declining trend to the late 1980s. Note also the step ups every 20-30 years. 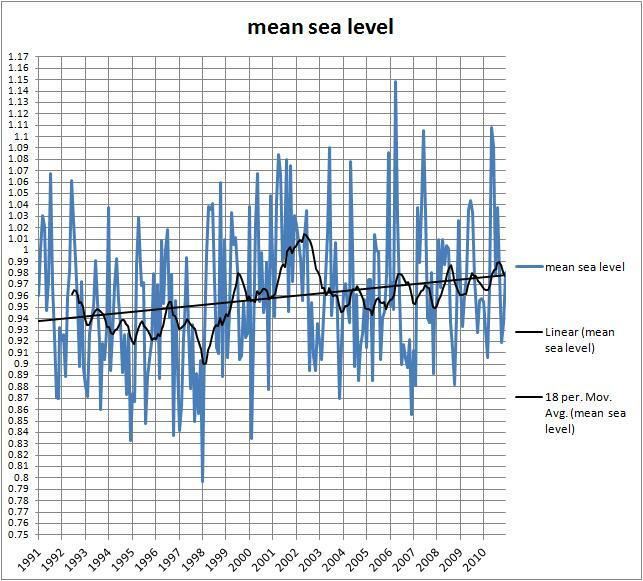 Therefore, while we can say quite confidently that for most of the 20th Century sea level rise could not have been above 1.7mm/year, as stated in Climate Change Risks to Australia’s Coast, we cannot rely on data from only one or two stations. 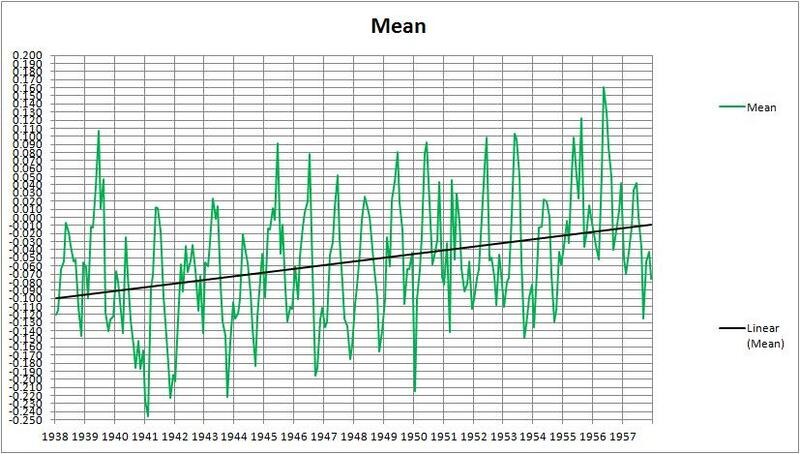 I have therefore plotted graphs of the mean from 1959 (when 4 sites became available) and 1966 (10 sites), to show trends over 52 and 45 years respectively. 2.63mm/yr – which is still a far cry from 3.8mm/year! 4.5mm per year! That’s much more than 1991-2010. Another thing to remember is that the mean tells you nothing about local conditions, and sea level is all about local conditions. High tide is far more significant. Note the rises in 2003-04 and 2007-08- matches the mean graph, but not trending up. And finally, the 1966-2010 graph of MSL and scaled SOI (monthly values/ 100). The relationship is pretty obvious. 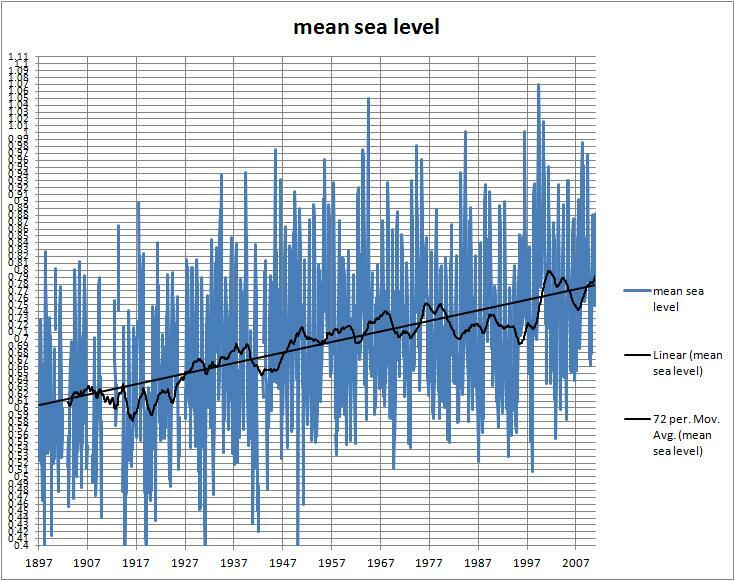 Sea level has been rising gradually since records began. Interdecadal variability is highly visible. SOI is a major influence on sea level. The rapid rise of the late 1990s is not unusual- it was more rapid 1938-1957. Any projections based on this short period are therefore spurious. There is no recent acceleration. The longer the record, the lower the trend. 3.1mm/year rise has been achieved- in the 20 years since 1991. 5mm/year was almost reached 1938-57, but is almost double the trend since 1987. 10mm per year is more than 2.6 times the trend since 1991, and 8 times the trend of the last 50 years! That’s a lot of glaciers and ice sheets to melt, and a lot of ocean heat content! 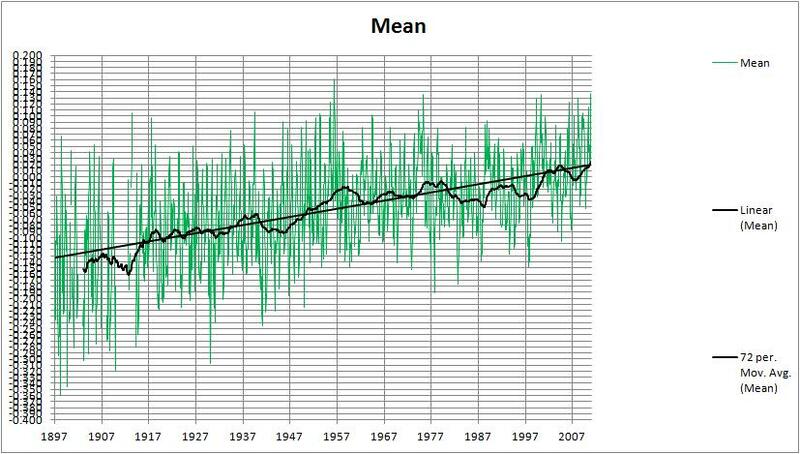 Sea level and climate can fluctuate about a long-term climatological mean from one decade to the next. The project to date is only just beginning to span two complete decades, so it is important to recognise that the sea level change observed over this time is largely a measure of decadal variability. Continued monitoring is needed to quantify the longer-term trend that is associated with climate change. We hope that Dr Jones and his team don’t hear about this- they’ll correct, adjust, and homogenise for sure! You are currently browsing the archives for the Sea level category.